Serpent has been busy updating their line-up. Tuesday they had the press release for their new Serpent Spyder 1/10 2wd Electric and today we got more info on the new gas-powered Serpent Cobra Buggy RTR GP 1/8 4wd. The RTR in this case means Ready to Roar, with this latest addition featuring an Italian made 3.5cc engine from Novarossi and is based on the successful Serpent 1/8 Cobra race Buggy. This RTR version will ship with a Dragon-RC pistol type transmitter 2.4 GHz which includes a LCD screen. Some other features include a pre-painted precut Avenger body, pre-mounted off-road tires on large diameter wheels. 4-wheel-drive, 3 geardiffs, and threaded 16mm bigbore shocks plus much more. 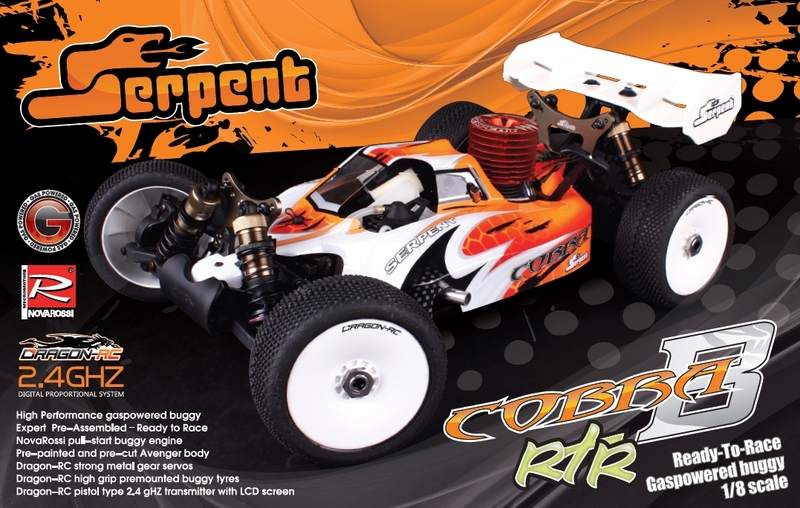 For full details, you can check out Serpents Press Release or you can check out the product page for the Serpent Cobra Buggy 1/8 4wd RTR. Great video, did you guys make it yourselves? Good job. I wish we were that good. That is the great work of the Serpent team. Well thanks for bringing us this video then.